Although it has a fresh approach to platforming, Schrödinger’s Cat is let down by a rollercoaster difficulty curve, randomly-generated repetition, and an unsettled tone. Hey kids! You know what’s cool? Science is cool. So get ready for Schrödinger’s Cat and the Raiders of the Lost Quark, outright winner of OXM’s newly-created ‘Game Most Likely to be Used in a Class by That One Zany Physics Teacher You Had’ Award. 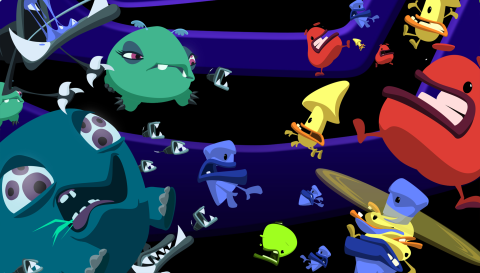 There’s been a breakout in the Particle Zoo (which is a zoo inside an atom that houses examples of basic particles - stay with us) and chaos reigns. Enter Schrödinger’s Cat (SC for short), who, with your help, has to platform and puzzle his way through different enclosures to restore order. It’s pretty hard to know who Schrödinger’s Cat is actually for. It’s like an educational special aimed in the direction of internet millenials, but the self-referential meme jokes have been dumbed down to the point where you can't tell if they're ironic anymore. Take the titular SC, for example. He has a variety of generic in-game exclamations, most of them formed by suffixing a scientific-sounding word with ‘tastic’, e.g. “Phystastic!”. Imagine a grown man, alone in a sound booth, earnestly shouting “Sla-bam!” and “Combotastic!” for this game. On the one hand, SC seems as exasperated by the gentle physics jokes and almost willful wackiness of the Zoo’s staff as you are; on the other he says “Derp!” when you screw up. And screw up you will. A lot. SC can punch and jump with the best of his platforming compatriots, but core to playing Schrödinger’s Cat is prudent usage of Quarks. They’re cute, floating particle pick-ups in bright colours, they sound like Elmo, and can be combined in groups of three to produce different physical effects. They come in four varieties: Up; Down; Top; Bottom. Three Up Quarks give you a little helicopter, three Bottom Quarks make a platform to stand on. And those can be combined further - mix those two examples to get a moving platform and so on and so forth. This is actually really fun, and a truly innovative mechanic. The best bits of the game are bouncing around the connective levels between zoo enclosures, where the supply of quarks is plentiful and you can helicopter and parachute like a lunatic. These areas have a lot of the feel of a Worms game, all awkward angles and randomly generated destructible platforms - perhaps not so surprising when you realise that Team 17, creator of the Worms franchise, was involved in publishing the game. Inside the enclosures is a different matter. For these more confined puzzle sections you’re only given a few specific quarks - if you use the wrong ones you just have to try again. Some puzzles are enjoyably challenging, but it can become almost unbelievably hard without warning, There’s a chance you’ll find yourself on your knees, begging, “what do you want from me?” and repeating the same puzzle indefinitely. It doesn’t help that the enclosures all follow the same basic fetch-quest format, so the feeling of repetition is amplified. Add to that getting all your moves given to you within the first ten minutes, and you’re left with no teasing out of the experience or new techniques to keep you feeling refreshed. The only change-up is getting new enemies, but you’re in more danger from your own mistakes than their attacks. That the levels generate differently for every playthrough is touted as replay value by developer Italic Pig, which, to be fair, it technically is. We leave it up to you to decide how often you want to re-live frustration at the same basic experience shuffled into a different order, and mildly patronizing science jokes hitting you at a ratio of one zinger for every three flops.